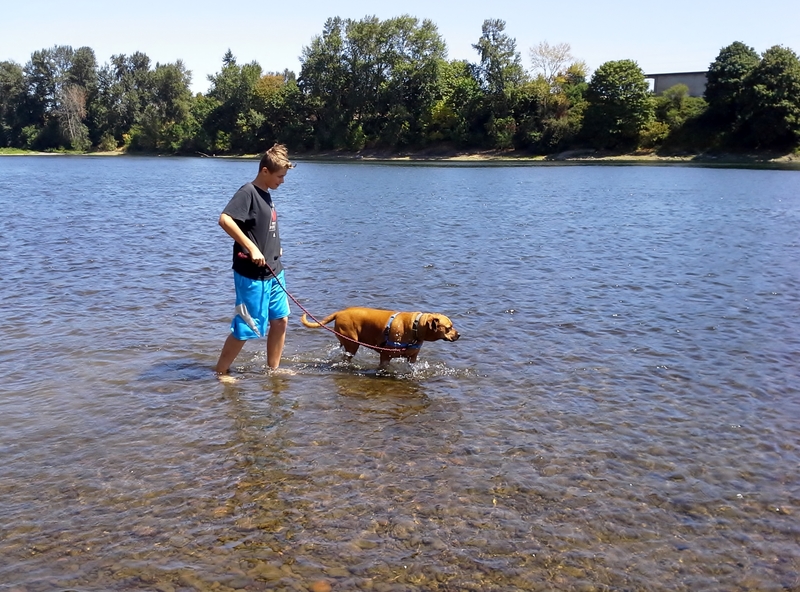 It’s been an extremely hot week in Salem, but that hasn’t stopped our dedicated dog walkers from showing up and getting our canine buddies out for a potty break, a dip in a kiddy pool, or some relaxing under a tree. 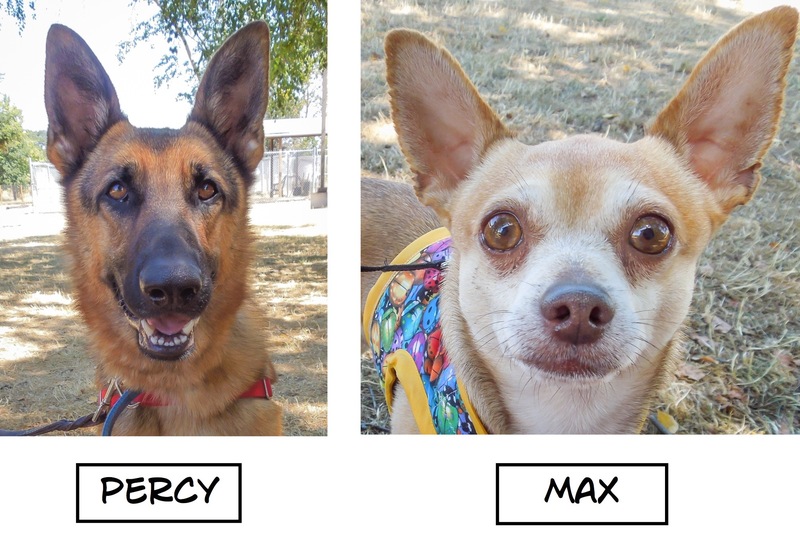 We also got some new arrivals through our partnership with ASPCA, some of whom already are in their new Oregon homes. 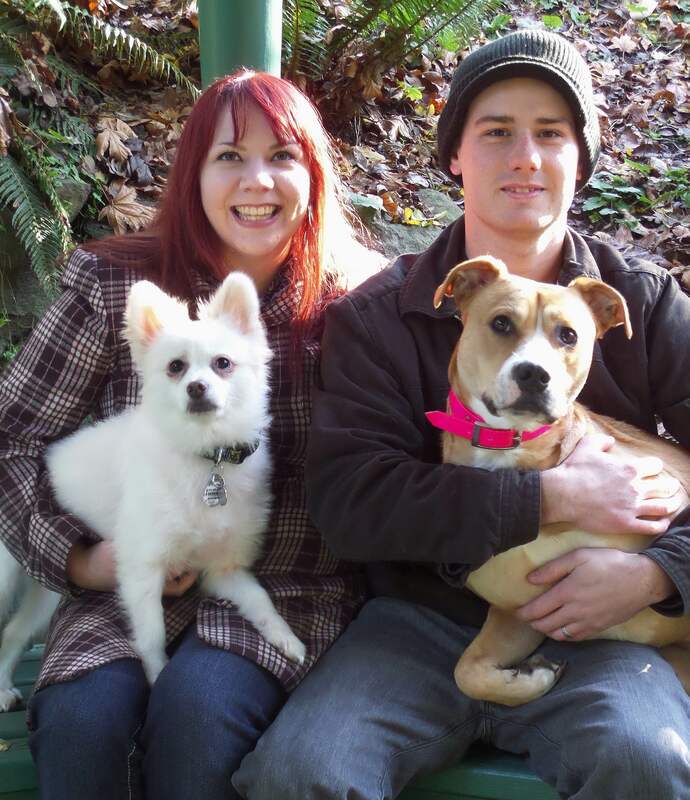 Here are the adoptions of Blog Dogs since my last post. I’d like to tell two adoption stories. 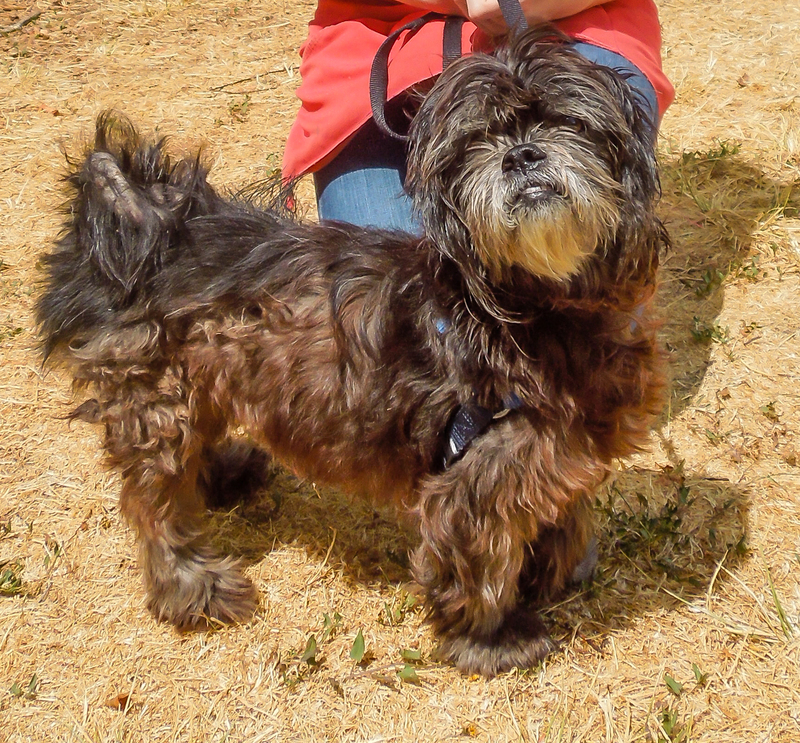 When Suzy was surrendered to us, she was a sad-looking little dog. She hadn’t been groomed in a very long time and her coat was matted and tangled and she could hardly see through her hair. 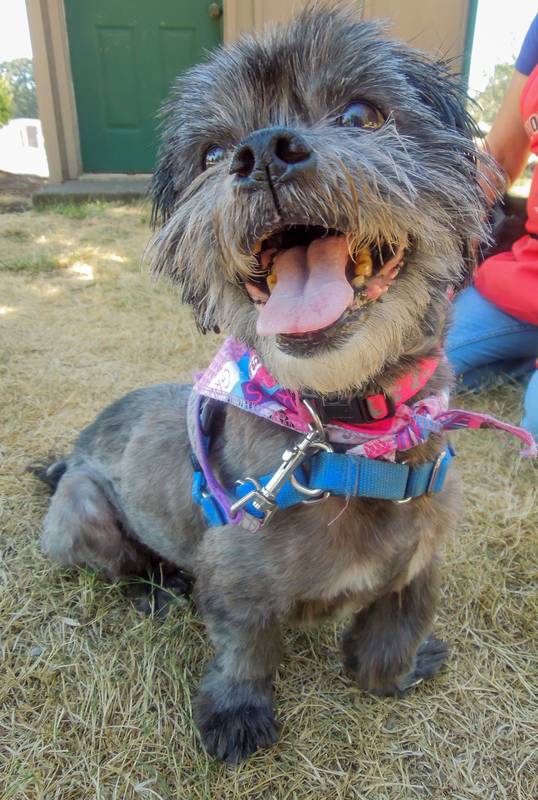 After determining that only a professional groomer would do, volunteer Marianne contacted her dogs’ groomer, Claws-N-Paws, who kindly fit Suzy in last Wednesday afternoon. I was still at the shelter when they returned. Not only did Suzy look like a different dog from the OUTSIDE, she ACTED like a different dog. There was a spring in her step and she looked so happy! Not to mention, it must have been exciting to actually be able to SEE again! The very next day her new look caused lots of interest from potential adopters and on Friday she was adopted. 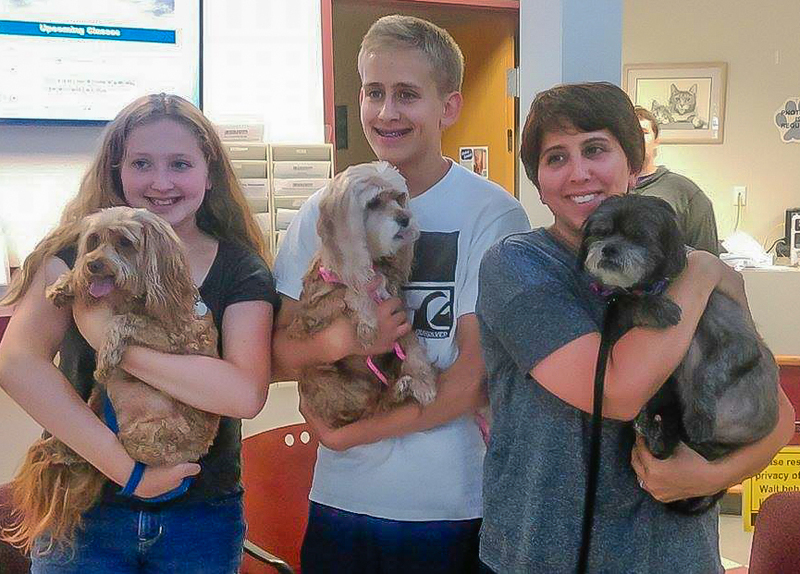 Here she is with her new family, including siblings Violet and Daisy. How’s that for a happily-ending story? I’m a newbie. I’m just about perfect in every way…except my weight, sigh. 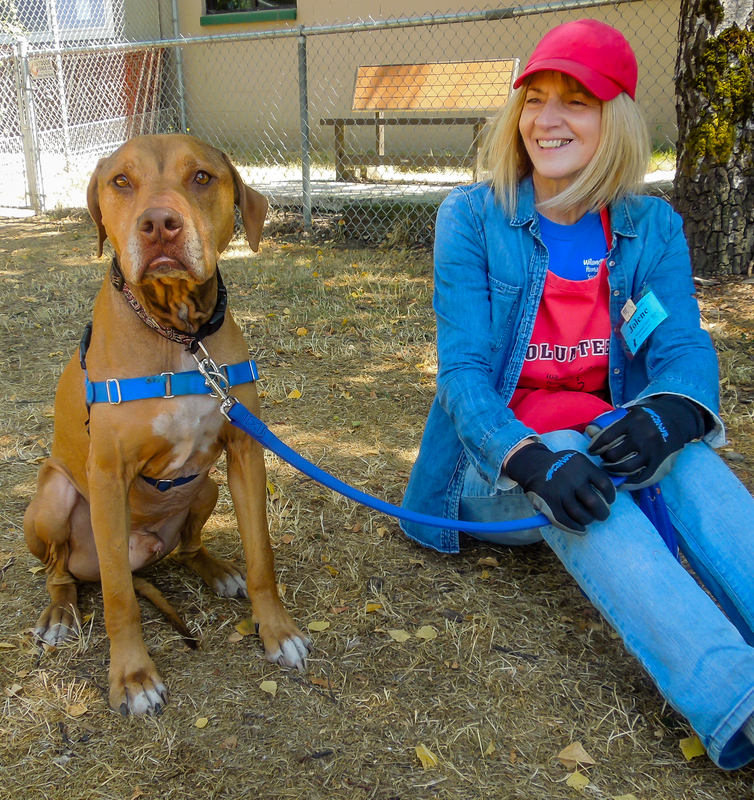 I met a terrific girl when I arrived at the shelter on Sunday. 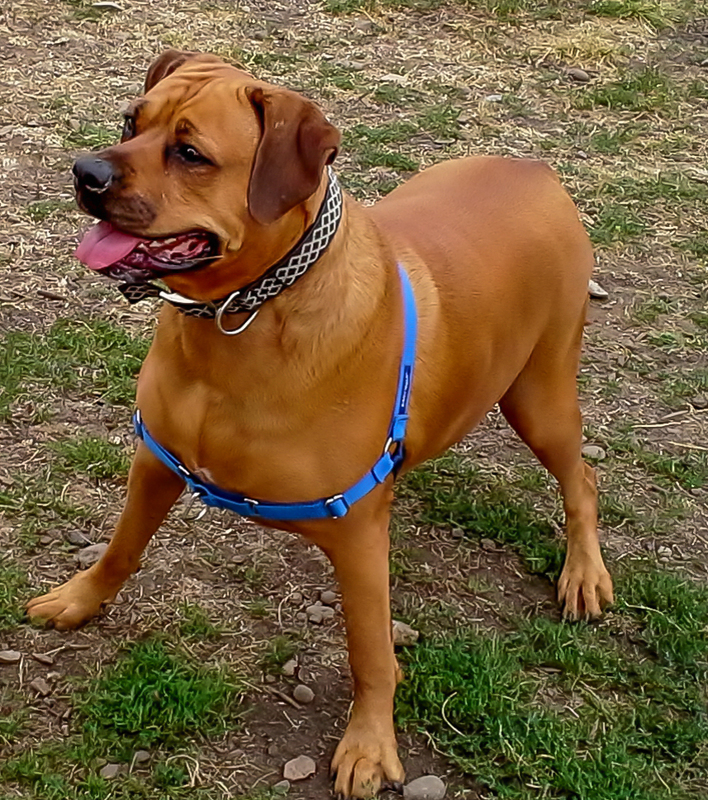 Her name is Gabba and she’s a six-year-old Boxer/Rhodesian Ridgeback. Gabba is a gentle, sweet dog. She’s a little shy when you first meet her, but it doesn’t take long, especially if you have hot dog bits, for her to warm up. She loves playing fetch, though she doesn’t always bring the ball back; she’s working on that. She also likes the pool once she gets in. 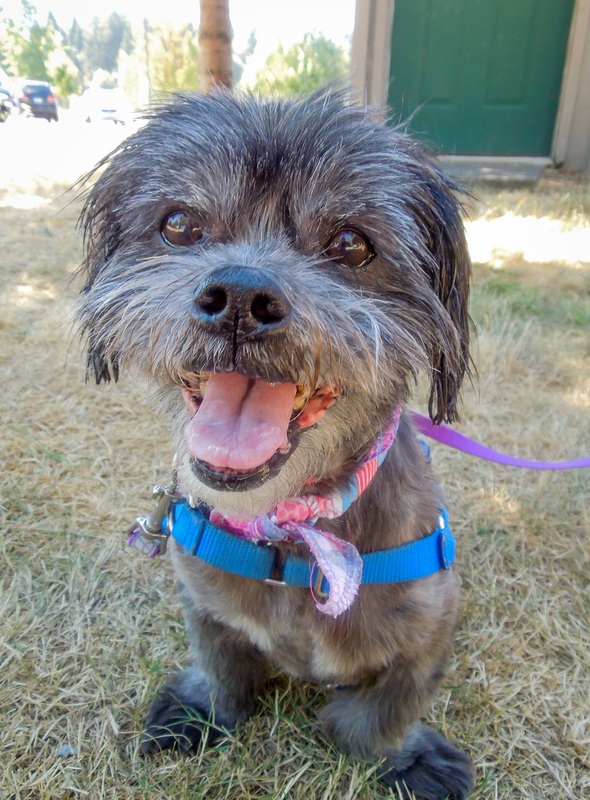 Gabba walks well on leash and is house-trained. She will be such a great family dog. She does need to lose a few pounds, so playing fetch and walking in the neighborhood, along with some light food, will do the trick. 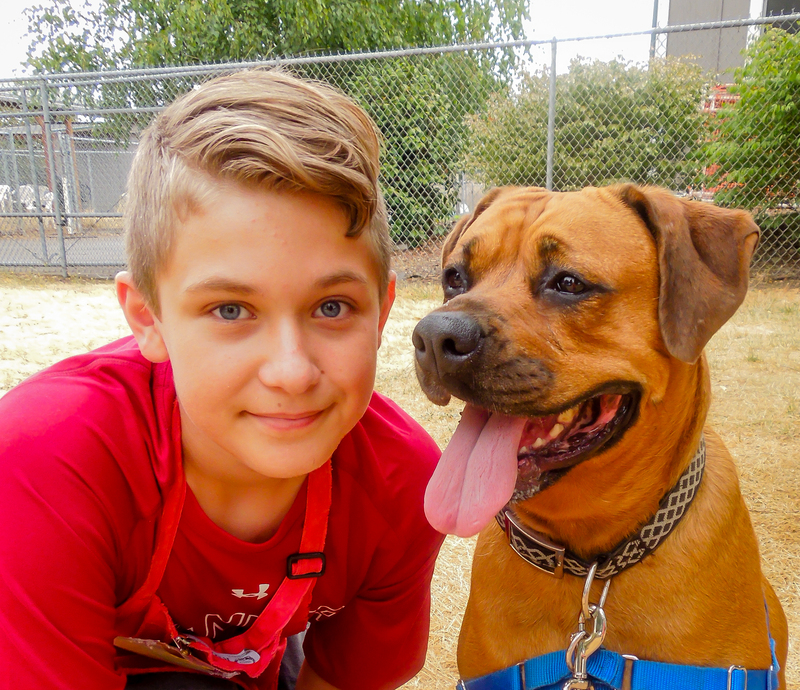 Here she is with Laslo, one of her new shelter friends. 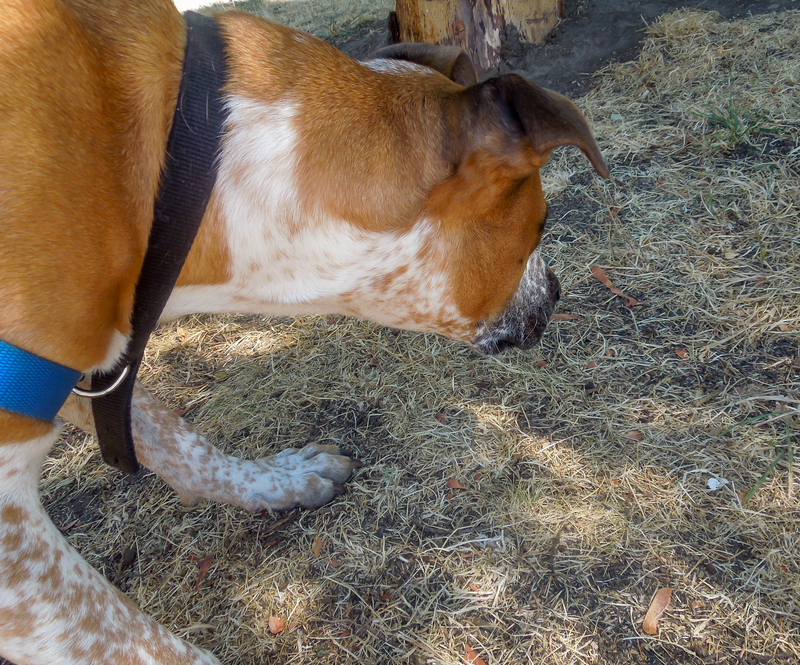 Here she was playing out in a yard with Laslo. 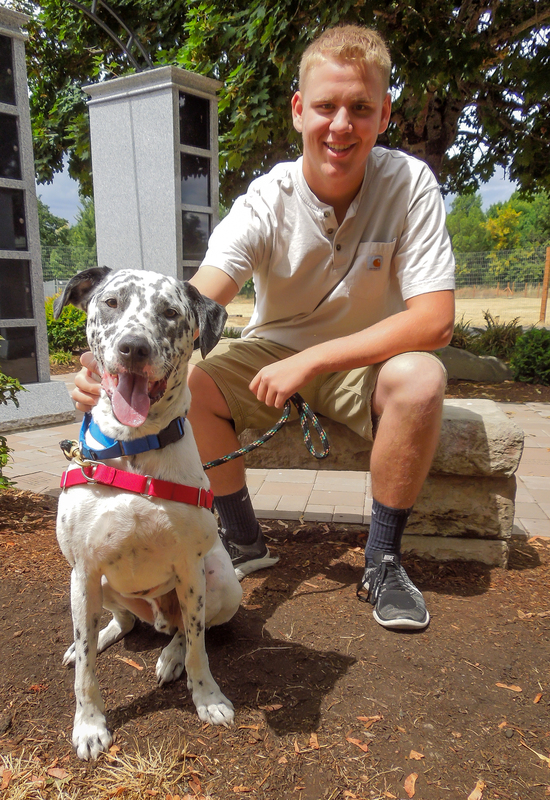 This afternoon Katie and Laslo showed up at WHS to take Gabba for an afternoon’s respite. I got a couple of pictures as they left for an afternoon of fun. 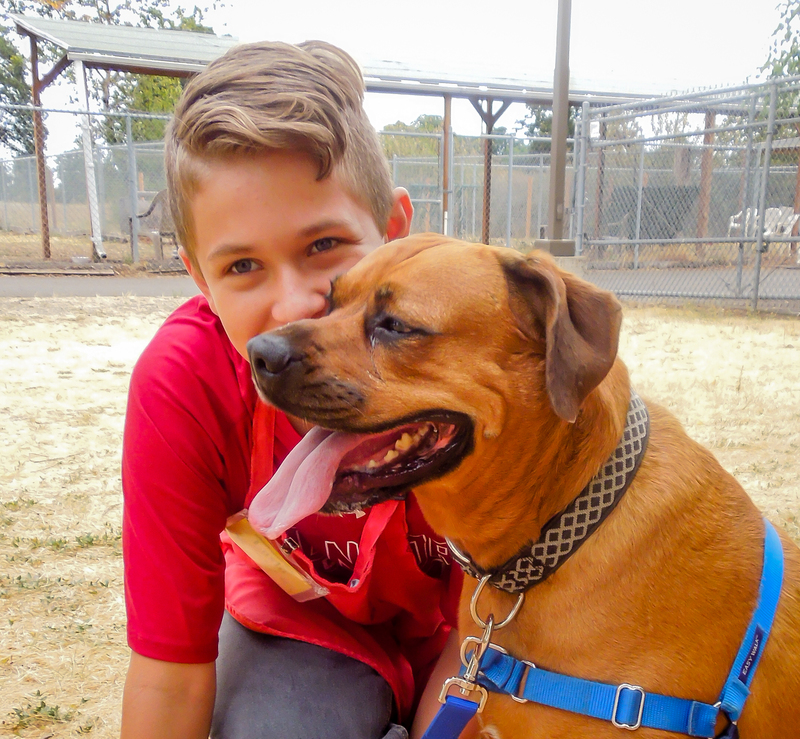 Gabba will be such a wonderful family dog! And here are a few pictures from her wonderful afternoon. 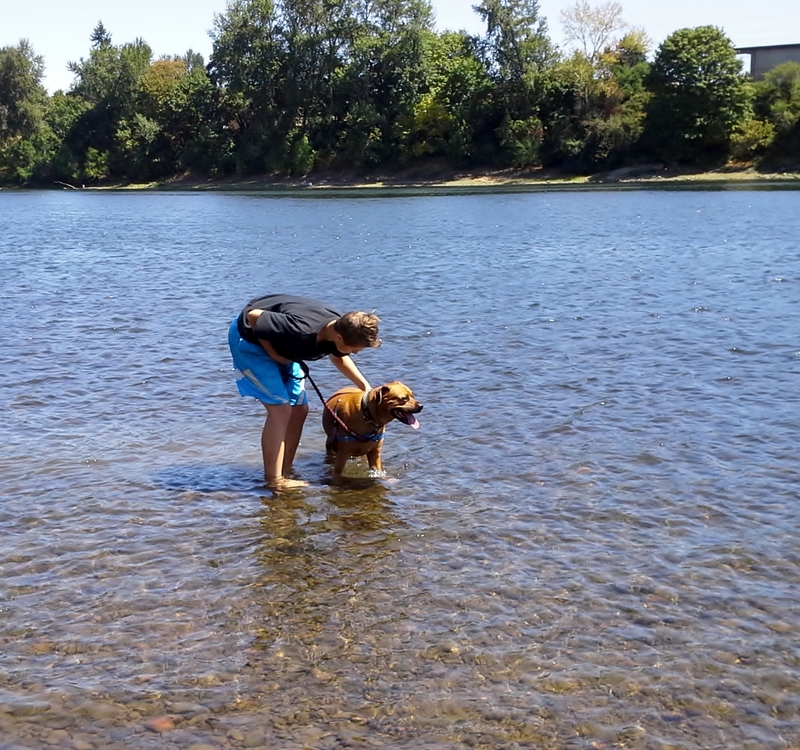 Turns out Gabba LOVES the water! It’s time to get serious about me getting a new home! 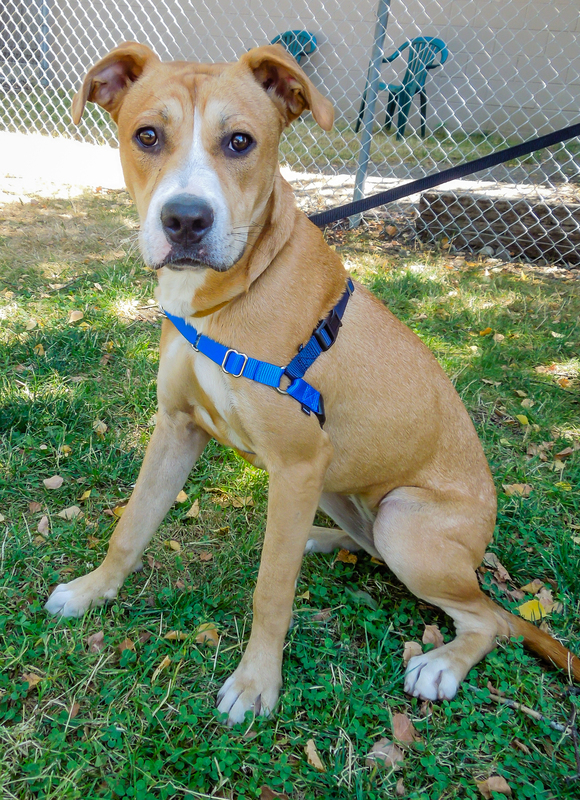 Sailor is a two-year-old Black Mouth Cur/Pit Bull Terrier mix. 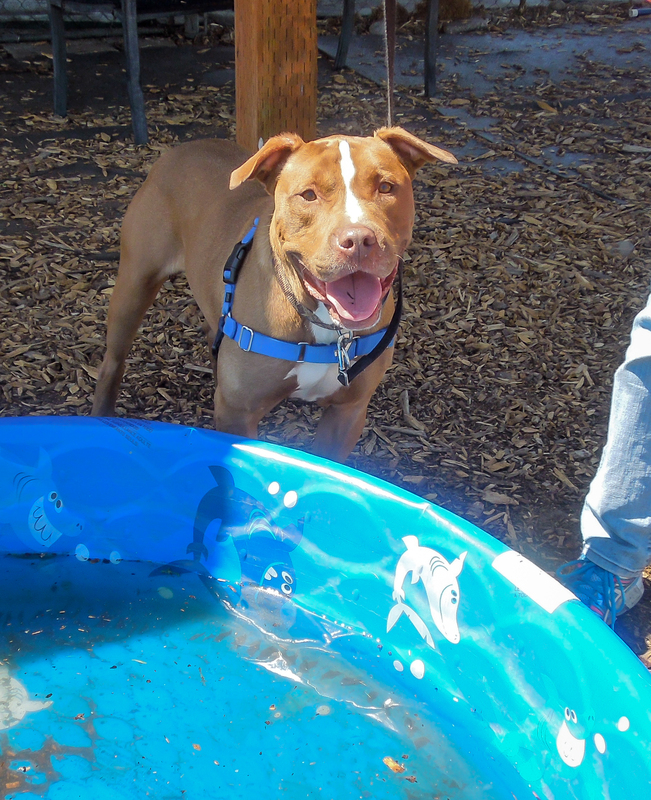 He has quite the outgoing personality and absolutely loves to play hard whether it’s a rousing game of fetch (he brings the ball back to you and drops it! 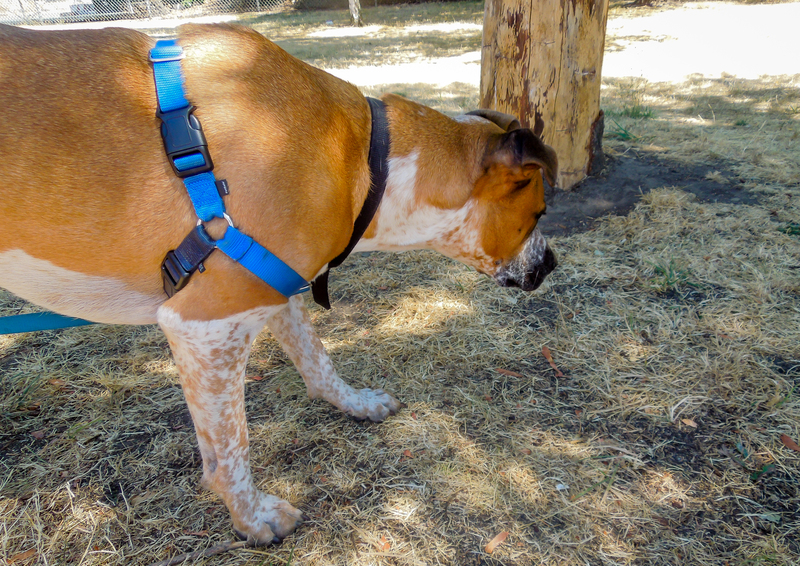 ), or romping with other dogs about his size. 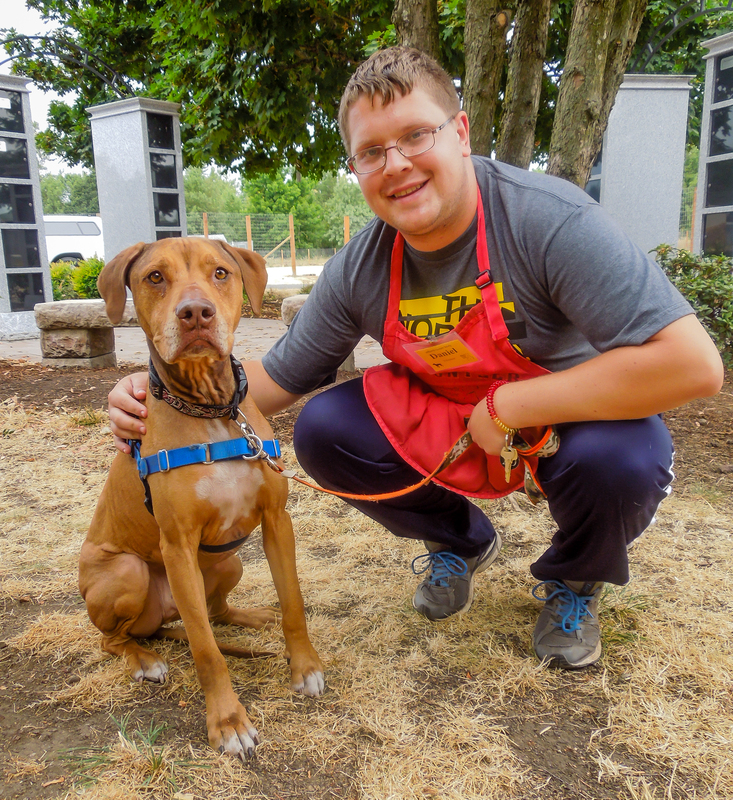 He listens well to instruction and is highly treat-motivated, so has the best qualities to be a star in our WHS training classes. He’s been waiting for a new family since June 8th. 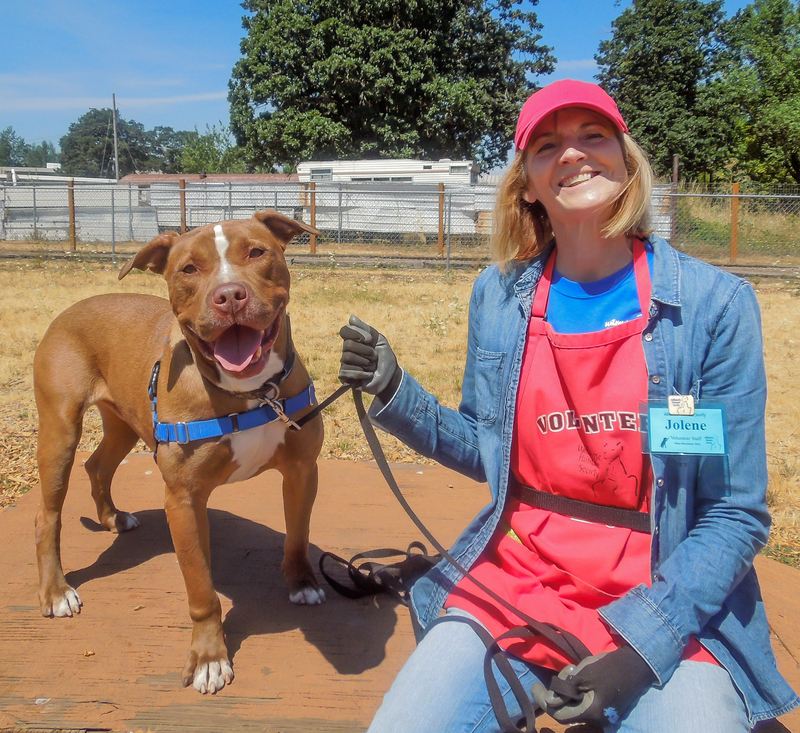 Sailor is a quick learner and such a fun character with a great sense of humor. I can’t wait until I can tell you he’s found his forever person! Here he was with Francis on Sunday. He informed me that he could speak for himself. 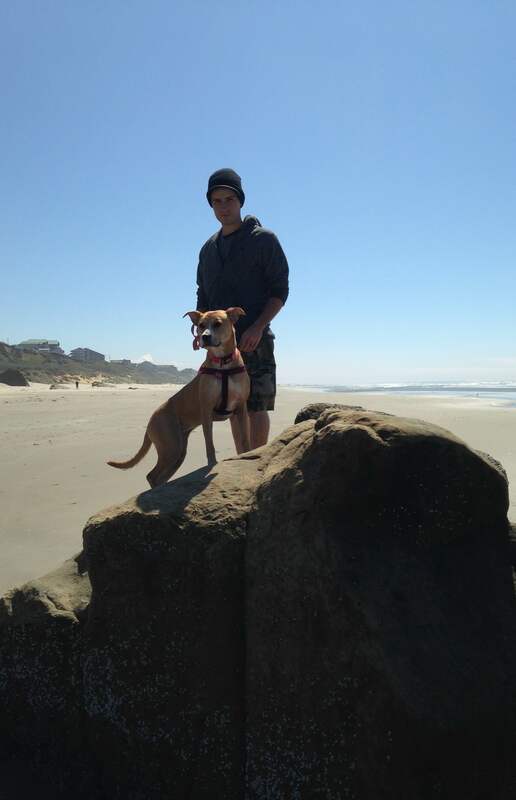 Looking for a dog who’s up to speed with his knowledge of Internet slang? Look no further! 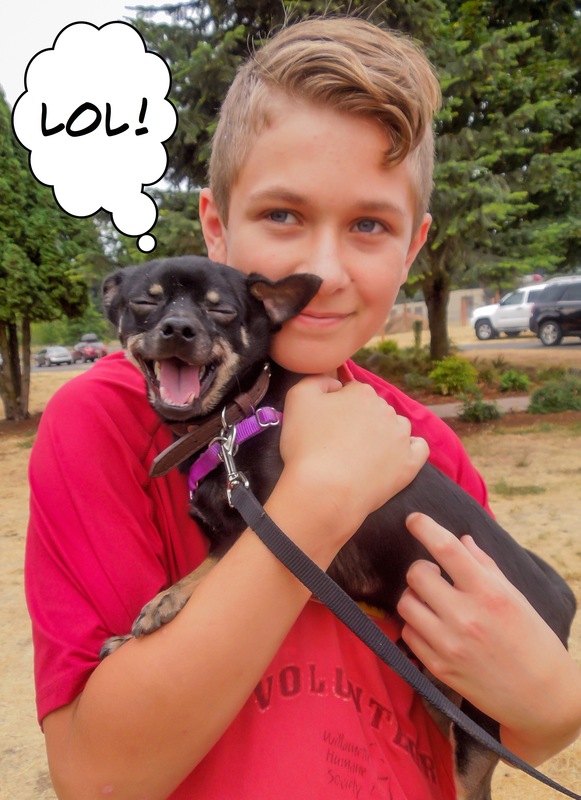 Yep, this is Pancho, a five-year-old Chihuahua mix with a great sense of humor. He kept telling Laslo dog jokes which Pancho found hilarious. Laslo not so much. But Pancho has a quiet, serious side, too. Here he was with Caroline a little later. 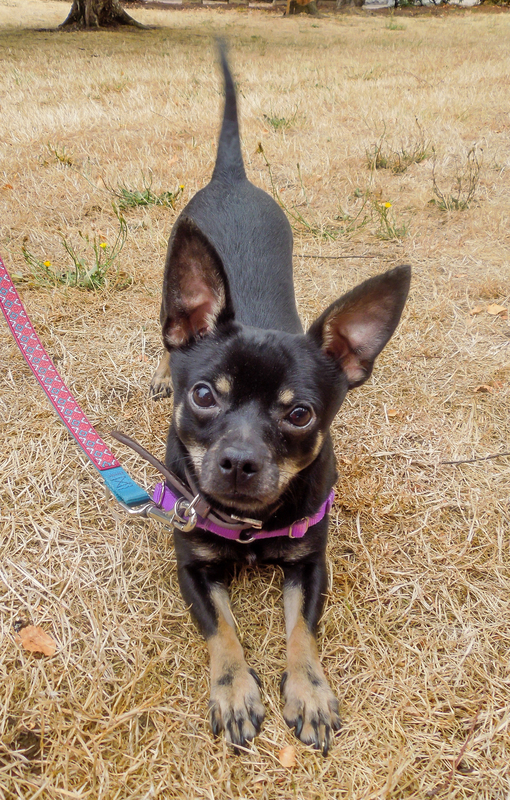 Pancho is an active little guy who is house-trained and has lived well with other dogs and older children. While he doesn’t like to admit it, he is frightened of cats. He liked crawling into Caroline’s lap, enjoyed munching on my hot dog bits, and loved getting tummy scratches. I have a feeling he’ll be adopted soon. He also has a cute little habit of play-bowing when he’s hoping for a treat. I’m a bit overwhelmed here at the shelter. Maybe I’ll get adopted soon? 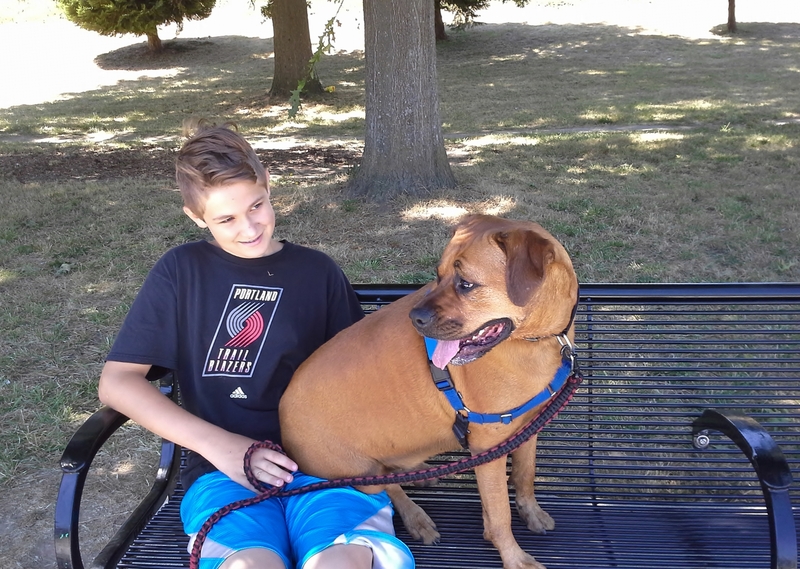 Another new dog at WHS is Cooper, an eight-year-old Hound mix. 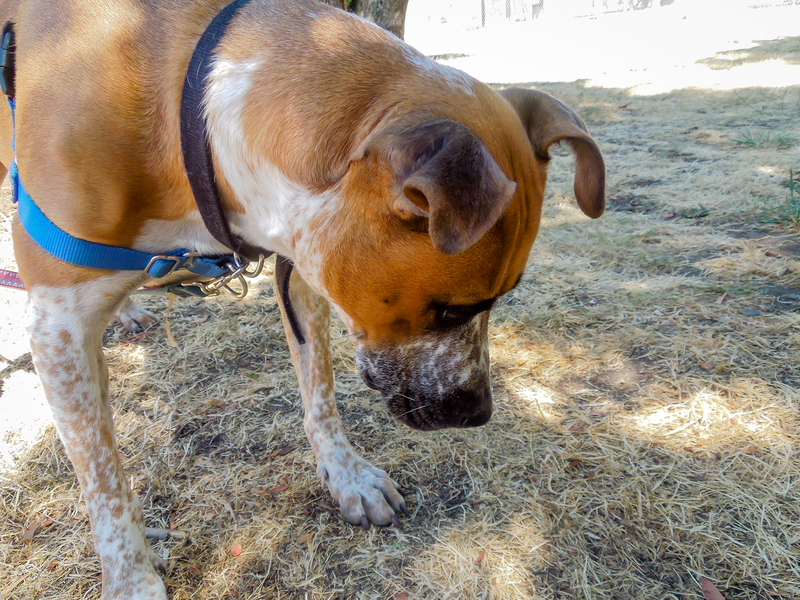 He is uneasy about why he is at the shelter, and a little shy. He’s a very gentle older boy who is looking for a home with older children or just adults. He also would like to be an only pet in the family. Here he was with Daniel on Sunday. Today Jolene took him out and I was so hoping for a Cooper-smile. Nope. Cooper is still uneasy. I sure hope he’s adopted very soon. He is such a nice boy! Emelynn couldn’t come walk dogs today, so I asked Caroline who her current favorite dog was. Without hesitation, she said Wiley! Off we went to get a cute picture of the two of them, sure I could get one of Wiley’s huge grins. We took our places, Caroline and Wiley at the bench and me in front. Wiley was smiling. I raised my camera…and this happened. Baffled, we decided to let Wiley go check out whatever it was he saw. Neither he nor we saw anything. Then I moved my camera and two of us started laughing. Whenever I raised my camera, a reflection dot danced across the grass! As you can imagine, we all had a good laugh. Even Wiley thought it was funny. 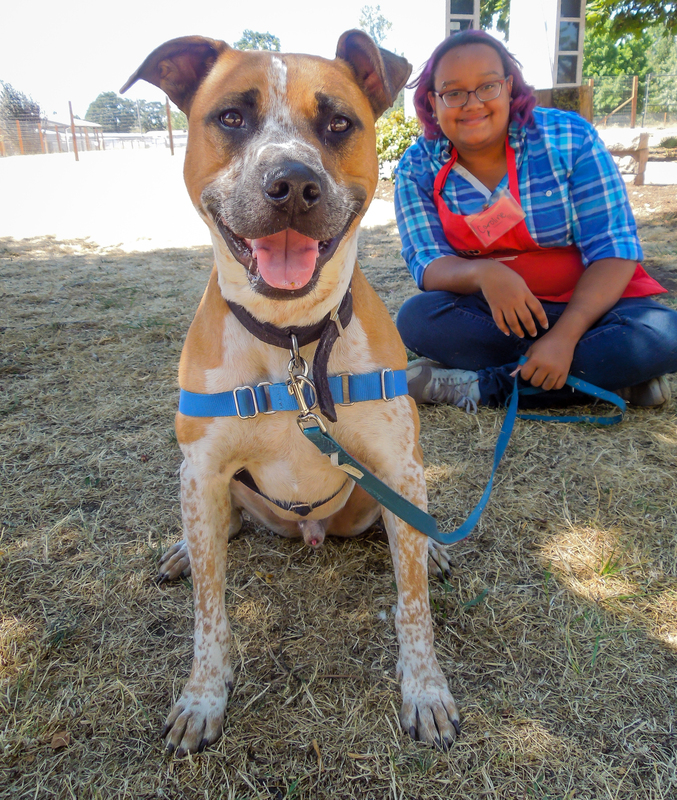 Wiley is a five-year-old Australian Cattle Dog/Boxer mix. He is house-trained as well as crate-trained. 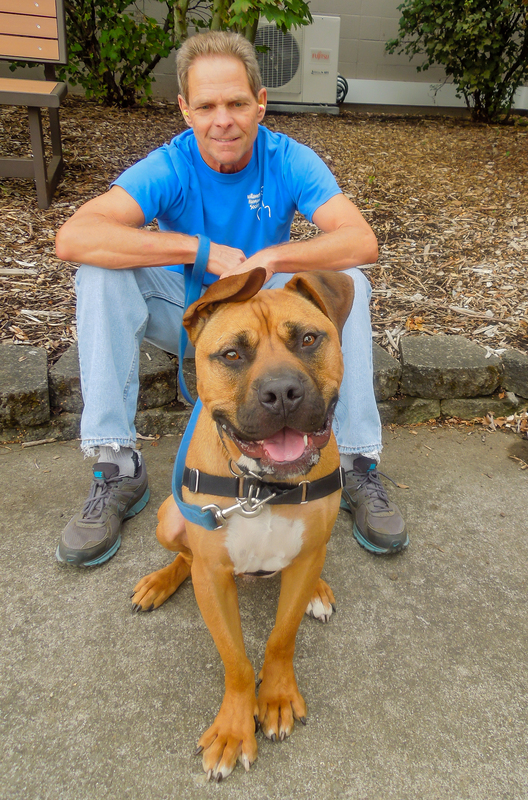 Wiley does need a home without children and he cannot go home with cats. He might prefer to be an only pet. 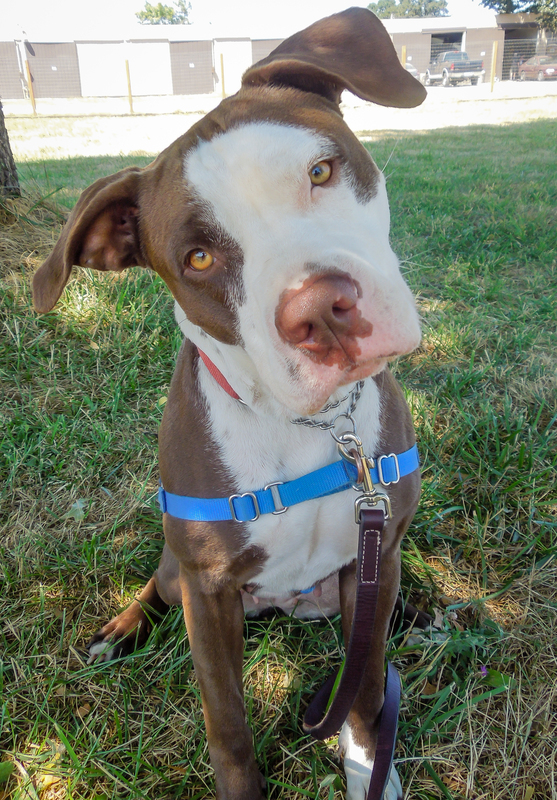 So Wiley has some quirks, but he has won the love of everyone at the shelter. I’m very popular here at the shelter! Can you guess why? 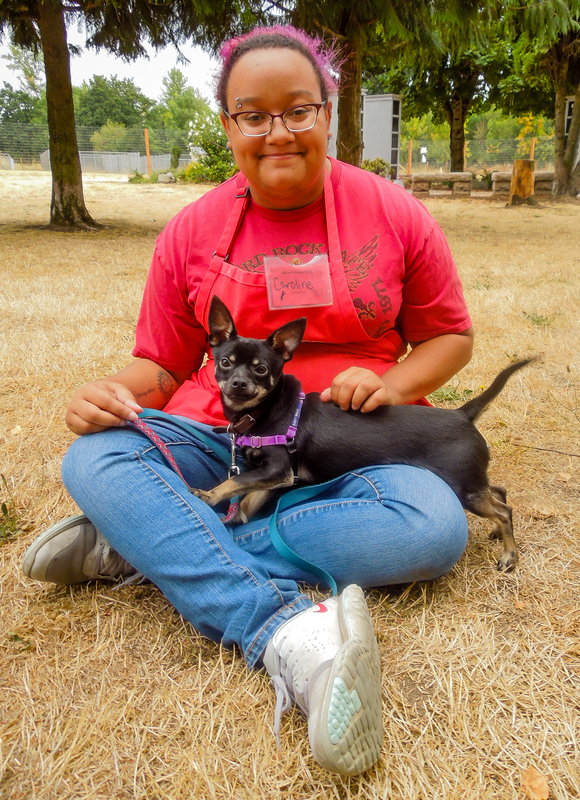 This is Lil Miss, a ten-year-old Chihuahua mix who, as you probably have already guessed, is a lap dog. And yes, she is really this cute in person. 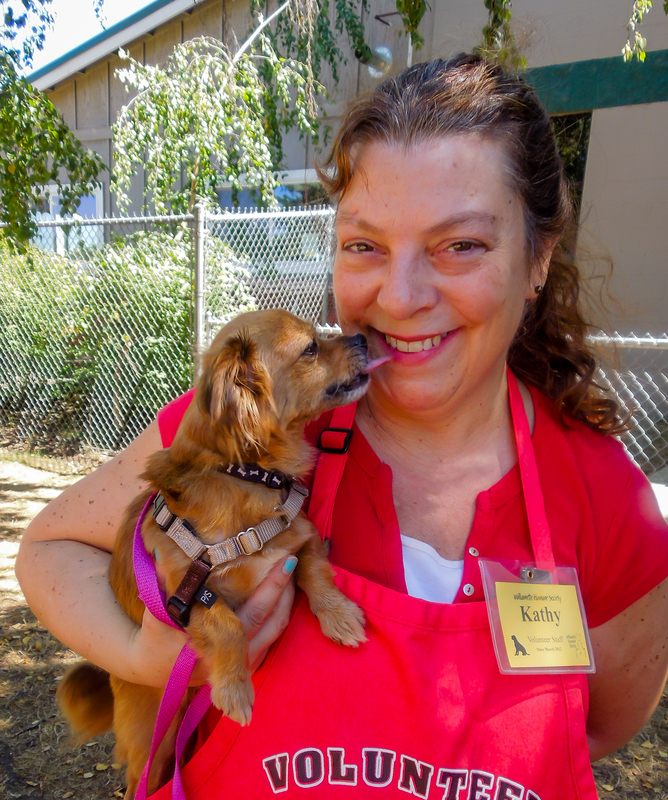 Volunteer Kathy fell in love with her today. 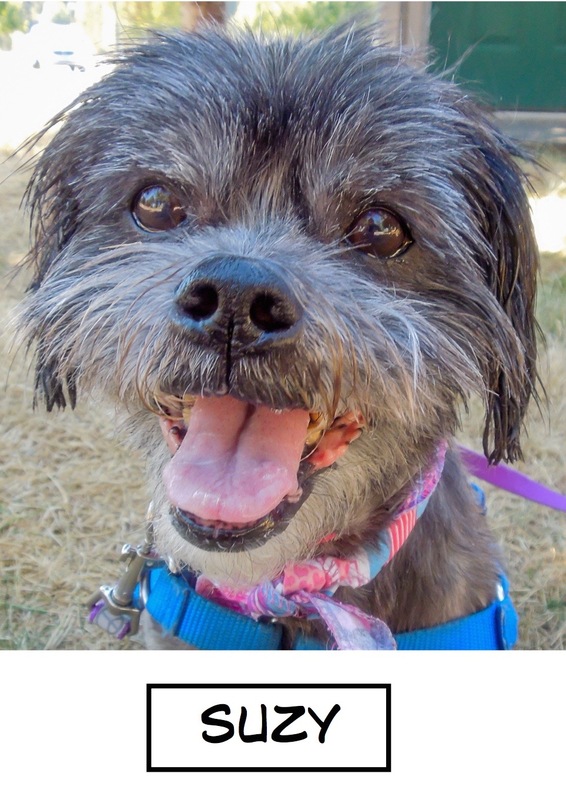 Lil Miss is house-trained and is looking for a calm, quiet retirement home. This gal will be adopted in no time, I’m sure! My name is Zorro! Although he was a fictional character, I’m very real! 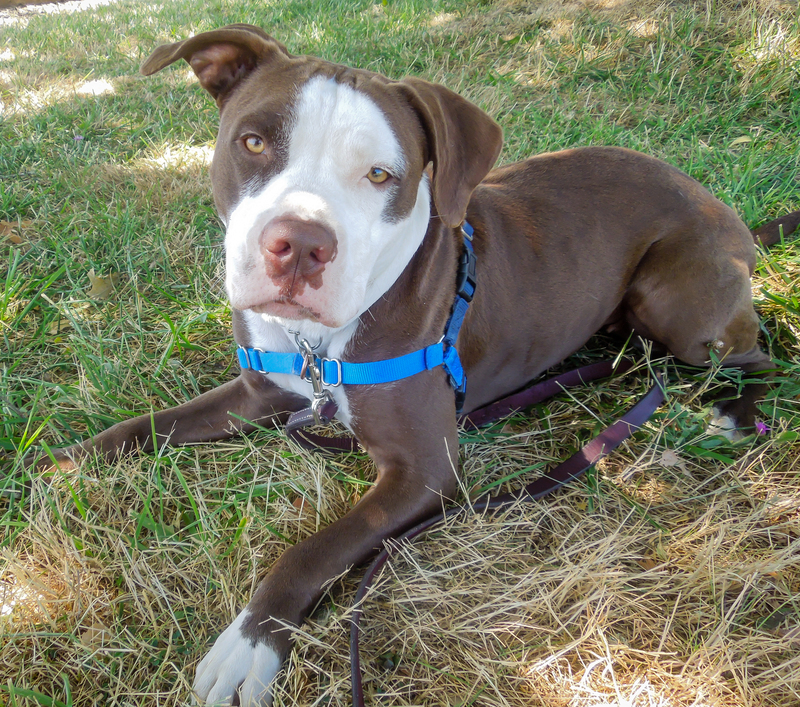 This handsome guy is a two-year-old Pit Bull Terrier mix. 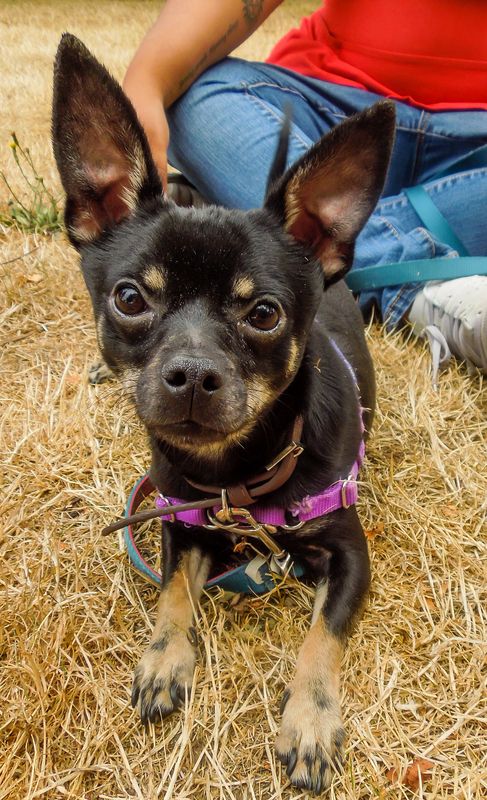 Zorro is looking for a home where he can be an active member of the family. He’d love going on hikes, camping, you name it, if it’s action! Then he’ll curl up with his peeps on the couch for the evening. 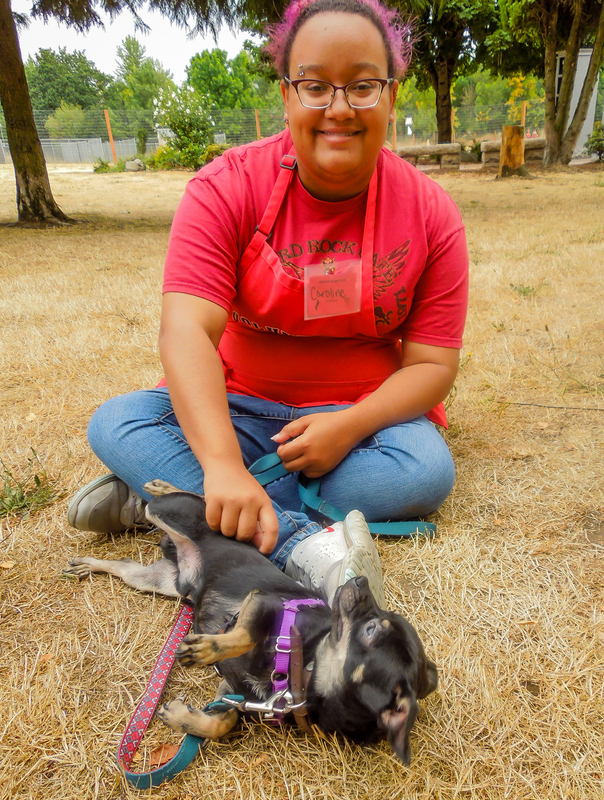 Zorro is feeling stressed in the shelter; he’s been waiting for the right adopters since June 27th. 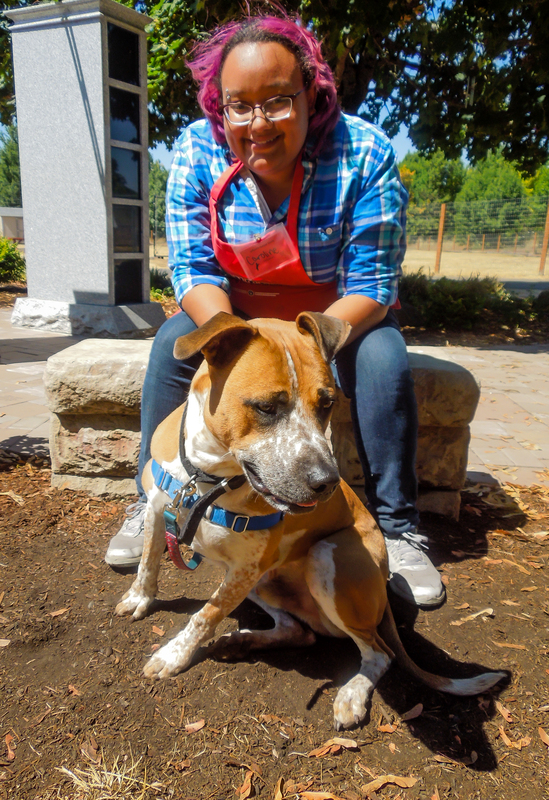 He is highly treat-motivated, so would love coming to WHS training classes and learning new skills. 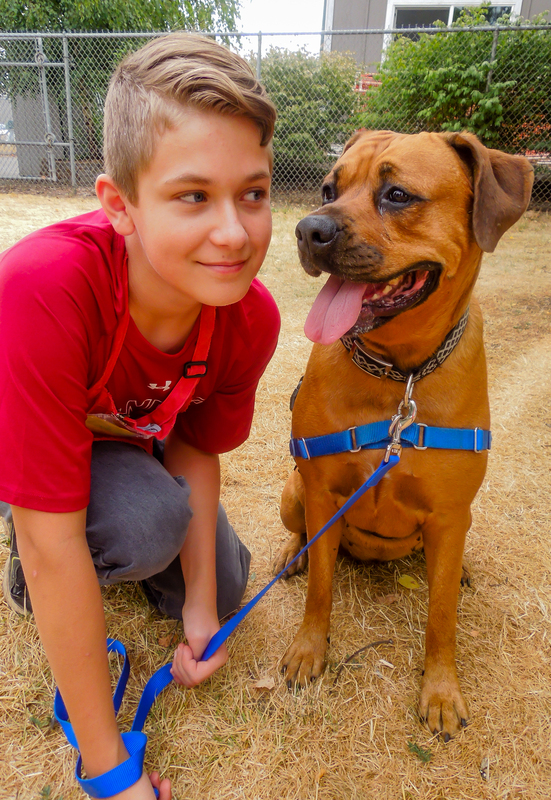 We’re hoping just the right fit of a family will find this boy soon. Here he was this afternoon in the big yard with Jolene. I tried to coax him into the pool, but he said he was not a pool dog and would just like to munch on my hot dog bits instead. I’m back and I’m looking for a forever home. 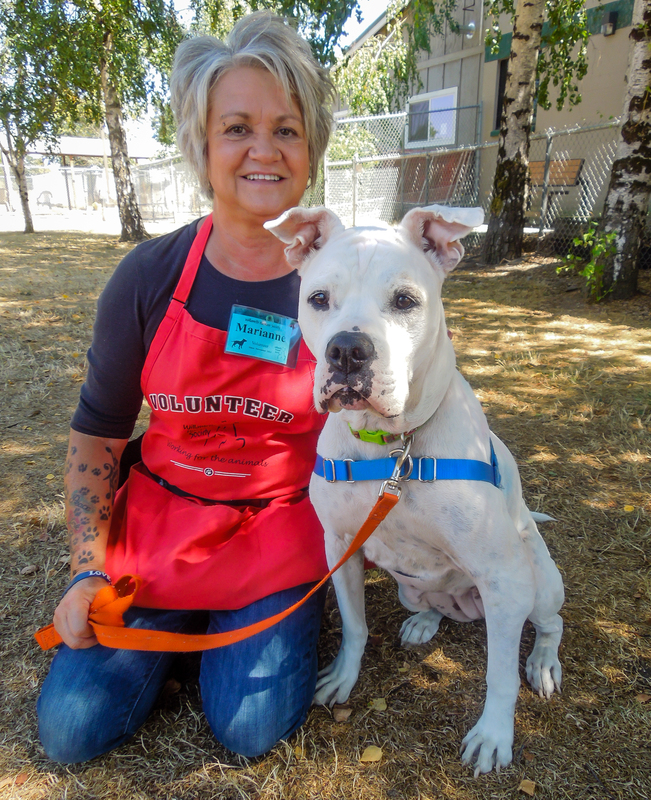 Cagney is back at the shelter, her family’s landlord decided to change the policy and no longer is allowing dogs. 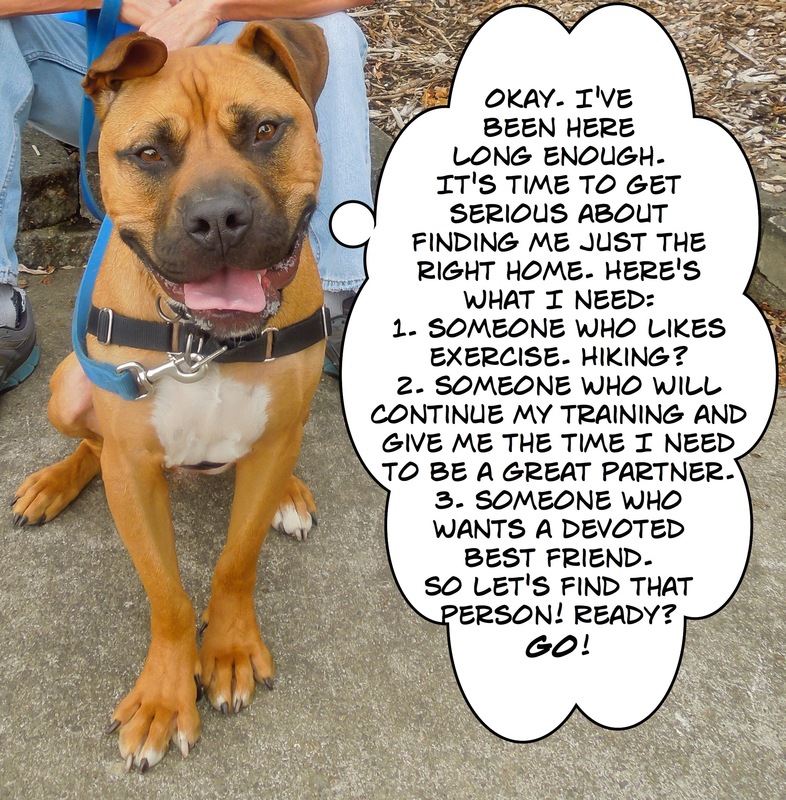 So Cagney needs another home. I took her out for a walk this afternoon and quickly remembered why I liked her so much the last time she was here. 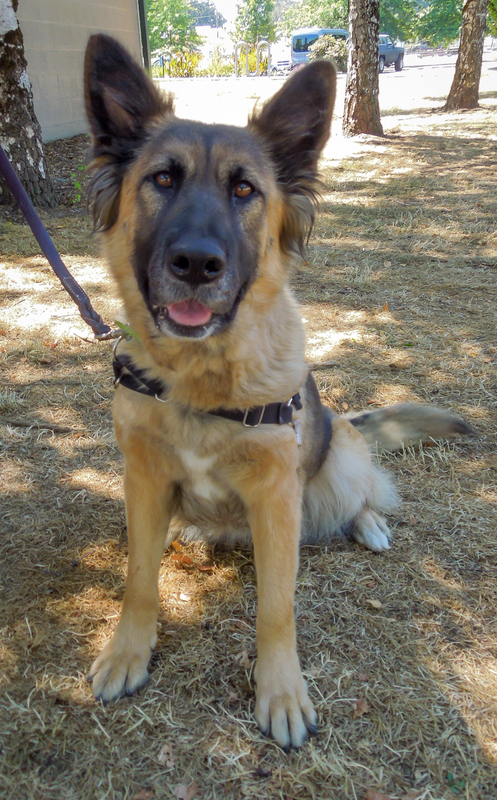 She walks perfectly on leash, took my treats gently, knows several commands and is so blooming cute to boot! We sat down under a tree for awhile and just talked. She’s hoping for a family with older kids, since she loves them. 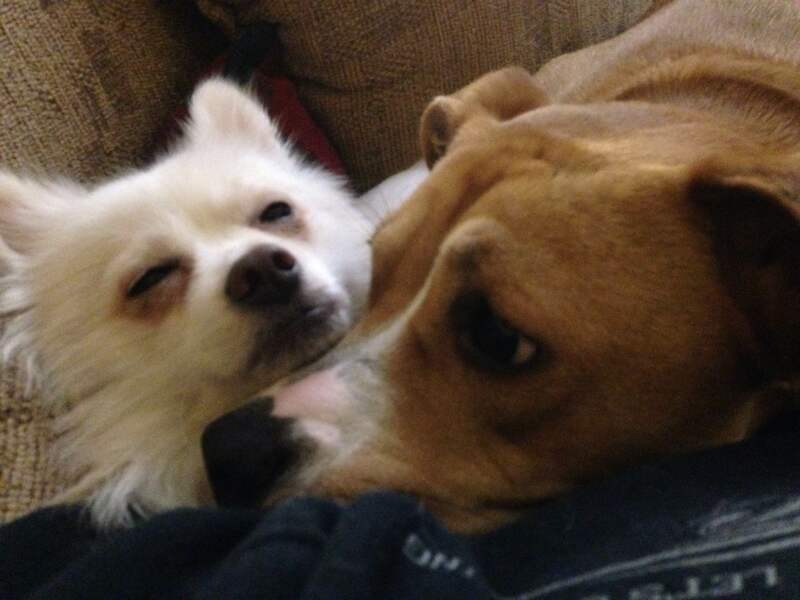 She’s a bit picky about her dog friends, and would rather just be an only dog. 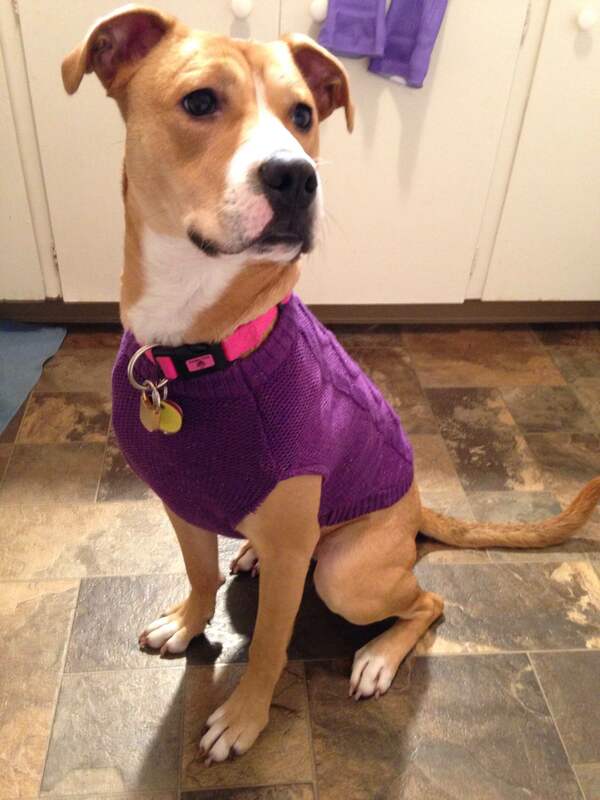 She’d like someone who will take her for walks and then let her snuggle with them in the evening. Oh, and a few treats every day would be great. She certainly enjoyed my hot dog bits. Then it was time to head back to her kennel. I hope her new family finds her very quickly! I’m still here hanging out waiting for you to adopt me! Are you coming soon? 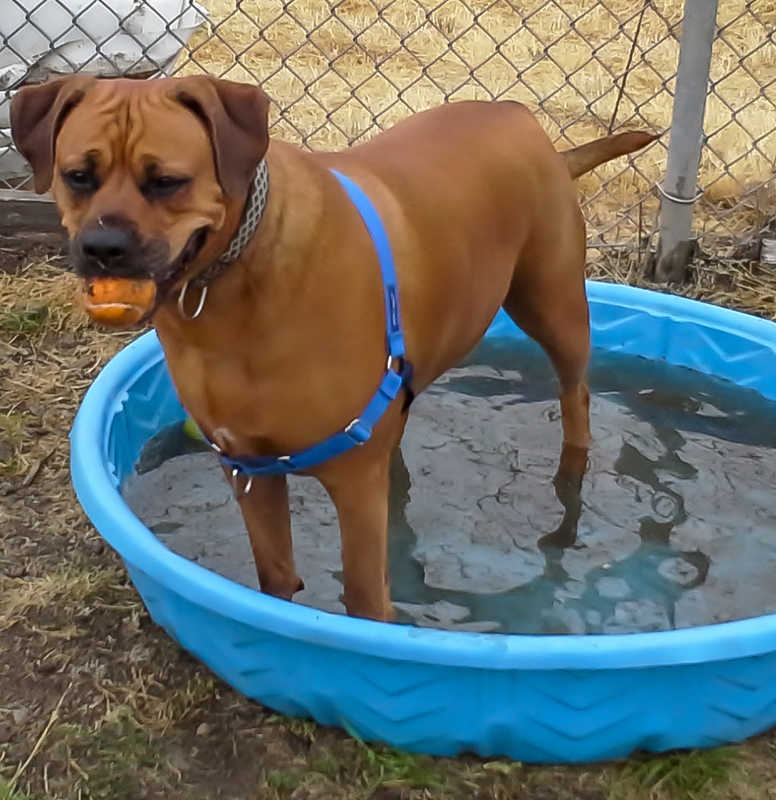 One of Marianne’s current favorites is sweet Shelby, an eight-year-old American Bulldog mix. She is a recent arrival (I wrote about her last week) and is a little worried about why she is at the shelter, but everyone she meets falls in love with this quiet, calm girl. She has a good history with kids and many other animals including cats, dogs, birds and farm animals. My camera makes her a bit nervous and she never looks directly at it, but what a sweetie she is! Wow! Do we have some fantastic updates for this post! 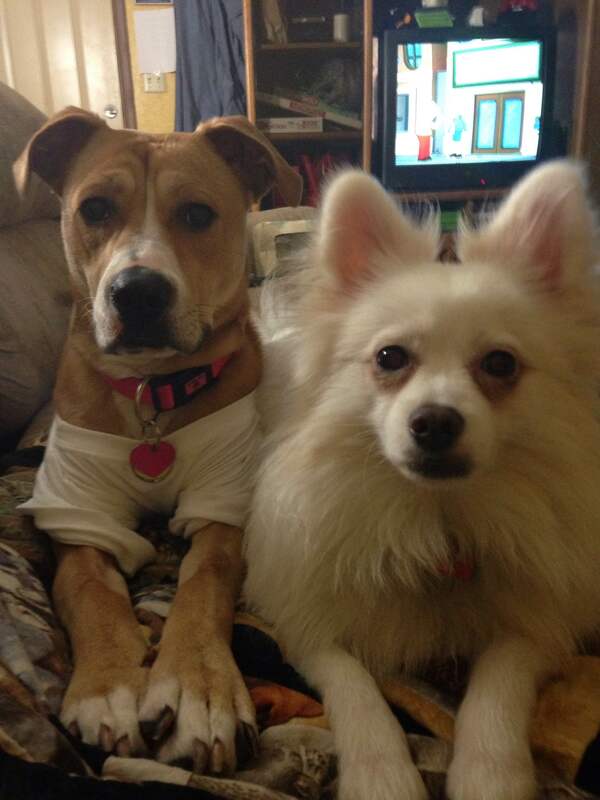 I got this update from volunteer Krystal who fostered, then adopted, Lilo. 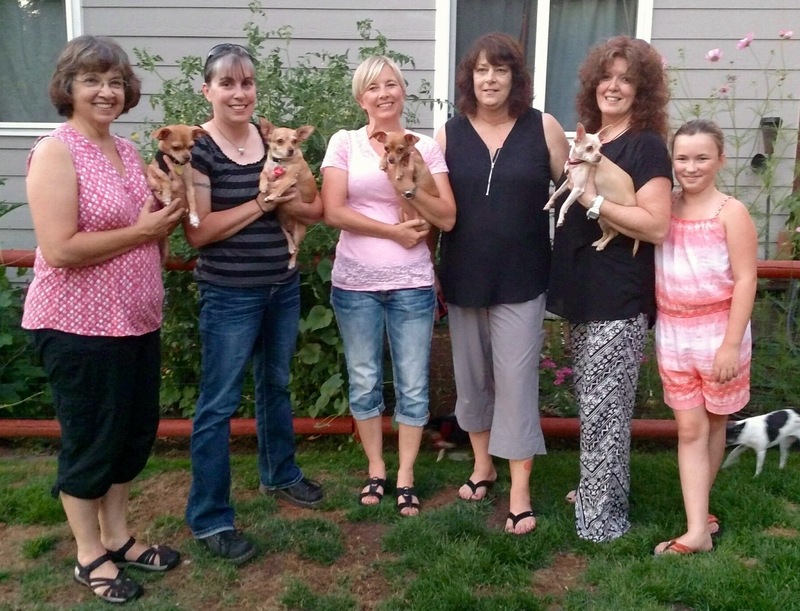 “Lisa Scott, one of the awesome fosters for WHS held a reunion party last night for all of Lilo’s siblings and her Momma Jewels. Here she was when she came to WHS from California in early July. 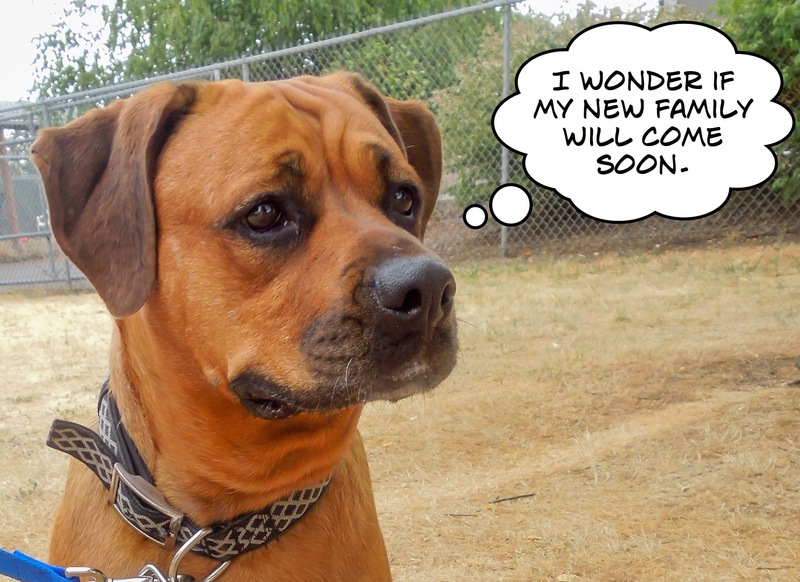 And here is her update from her new family. 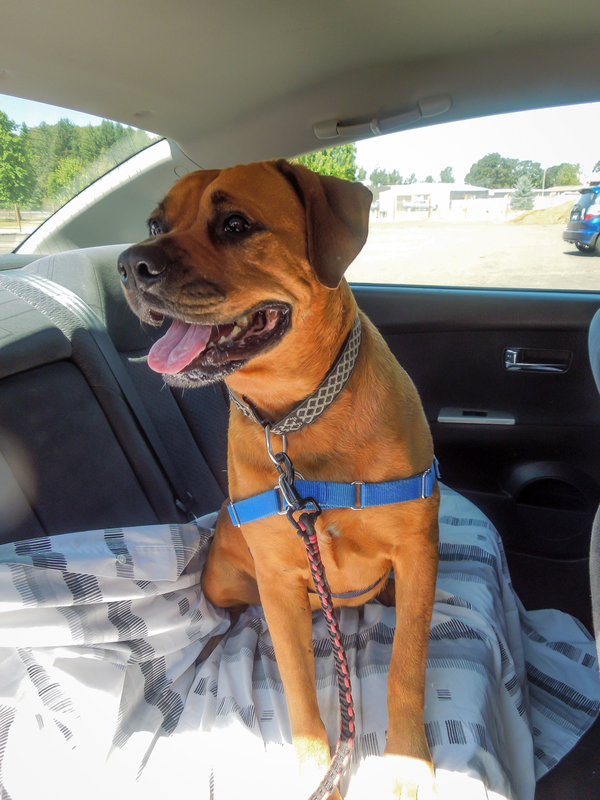 Here was Sami when she arrived at WHS in 2013. “In April of 2013, my boyfriend and I lost our 8-year-old American Eskimo to cancer. 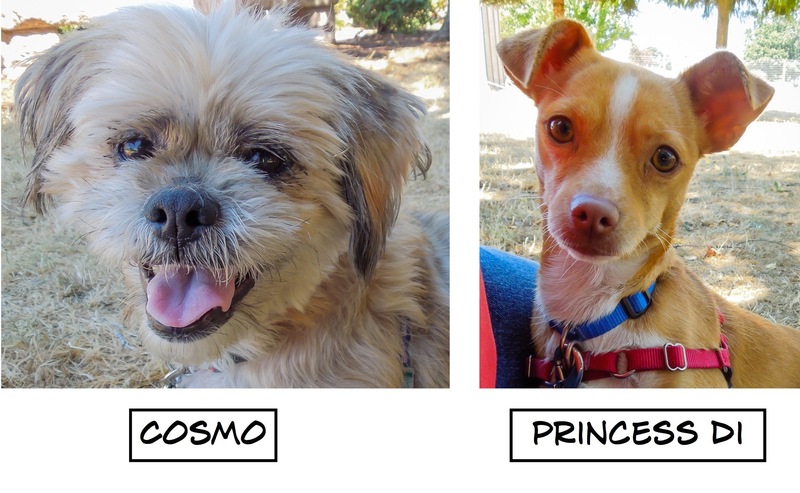 Our hearts, and the heart of our other dog Freddy (Pomeranian mutt), were broken. 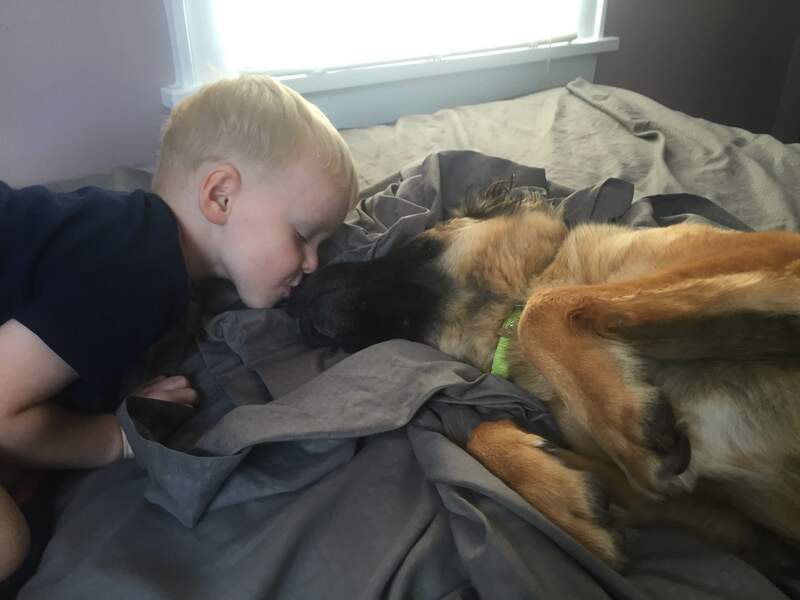 After a few months of grief, we realized how empty our home and bed felt. 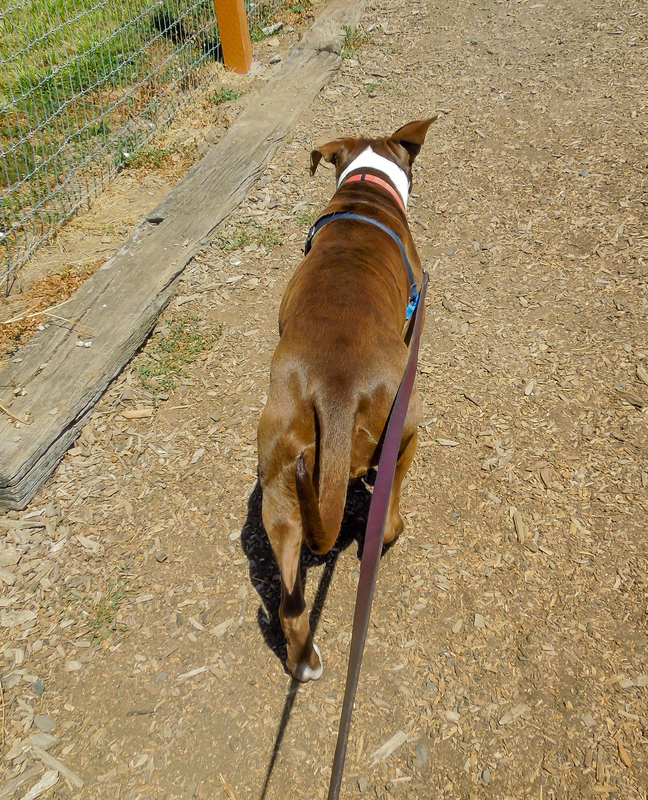 We discussed what kind of dog we wanted, one that would usually have a harder time finding a home; dark colored, one eyed, three legged, or the “notorious” bully breeds. 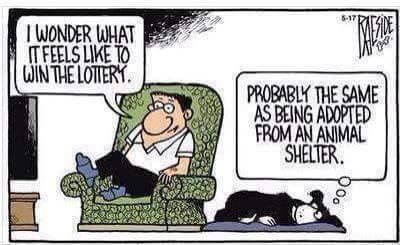 Almost weekly we walked through the local shelters looking for a dog that would fit our lifestyle. 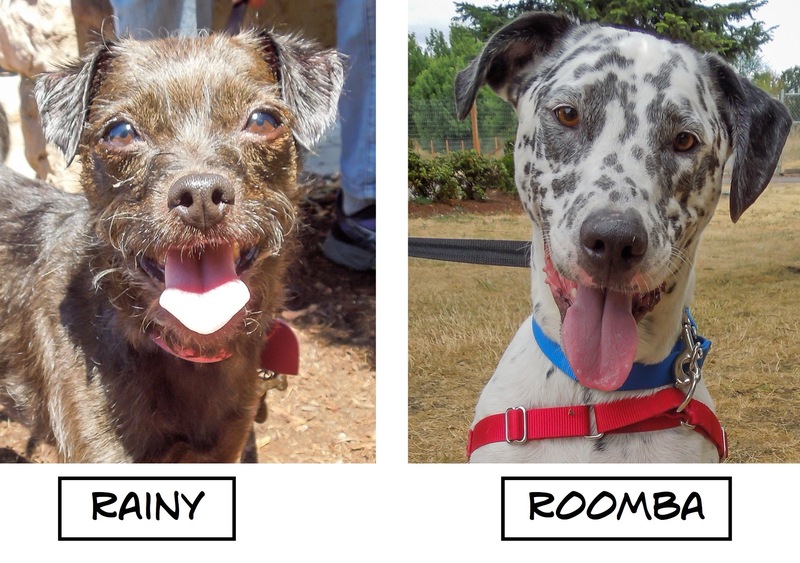 The first week of August we landed at Willamette Humane Society. 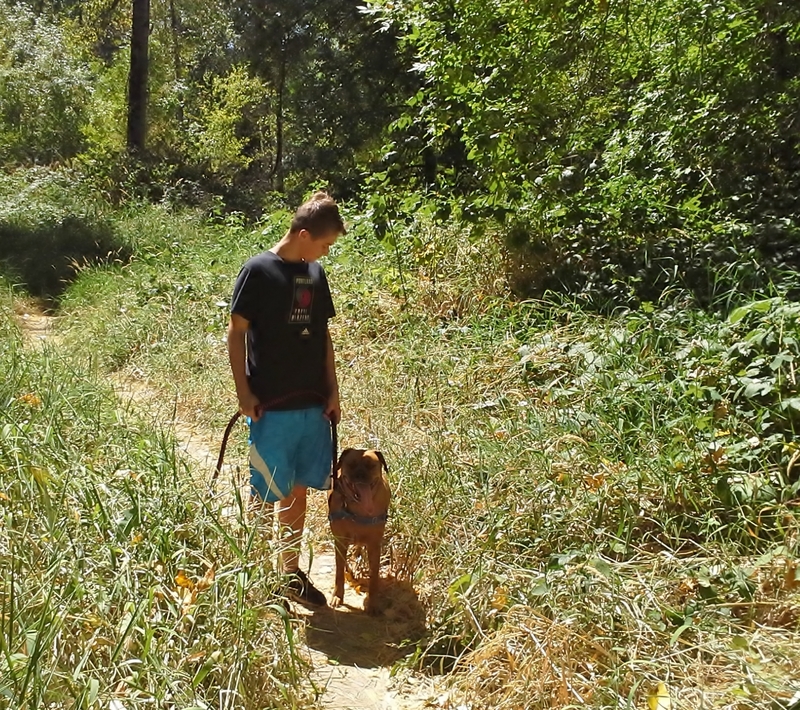 We walked slowly up and down the kennel aisles, spending a few minutes with each dog. 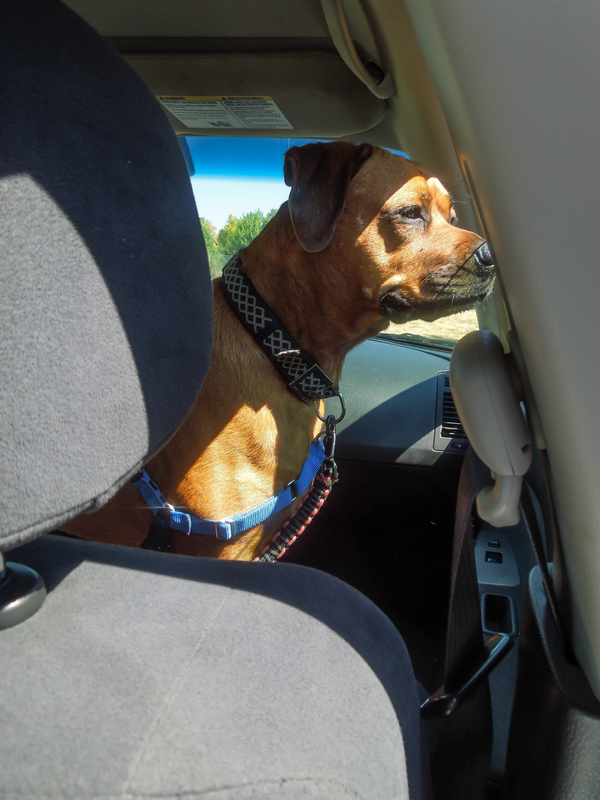 We lingered in front of a kennel with a little red pitbull type dog, wearing a large awkward cone and a mysterious scar on her head. She had perfected the puppy dog eyes, and was reeling us in quickly. 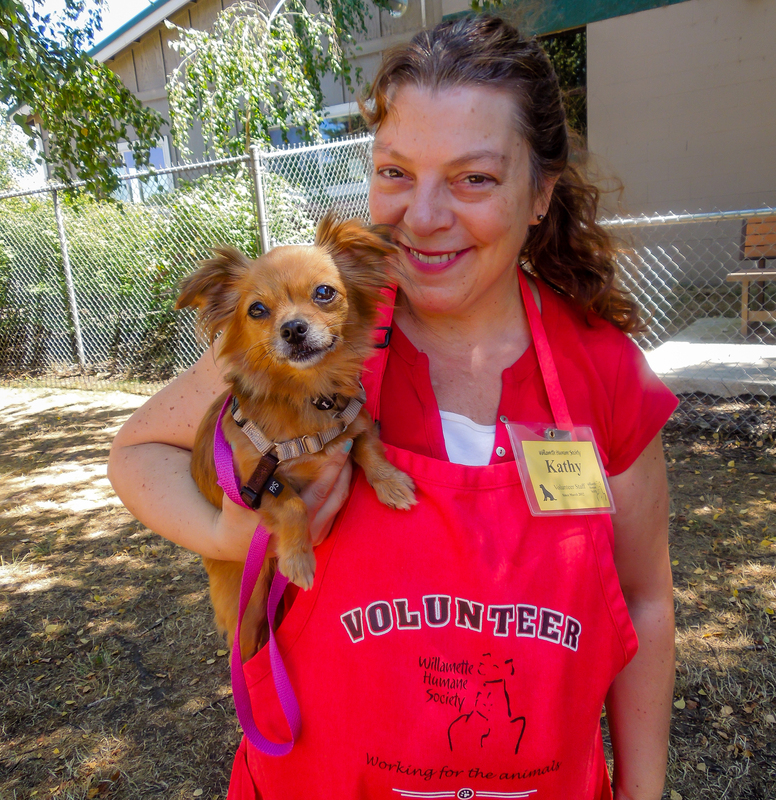 We asked a volunteer for some one-on-one time with this dog named Sammi. 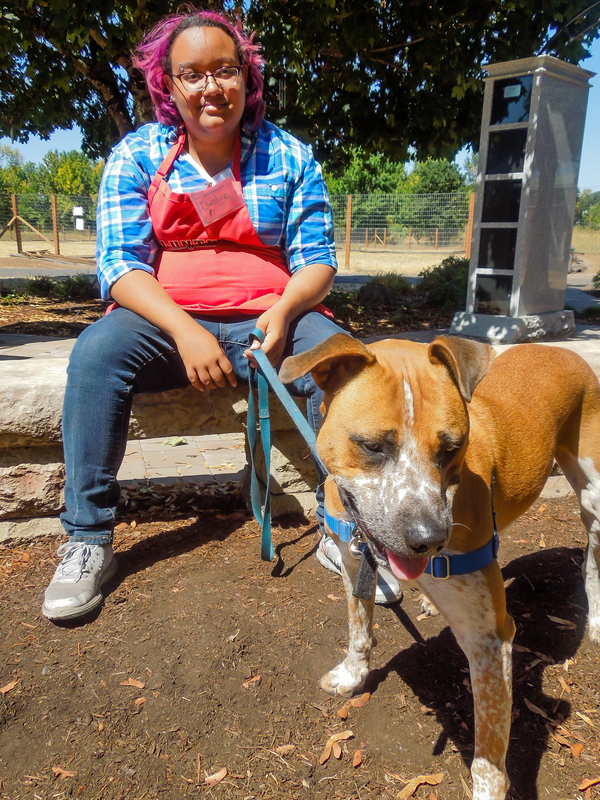 The volunteer informed us that Sammi was found as a stray in California, and brought to Oregon for a better chance at finding a home. Once outside, in the dog play yard, we were smitten. 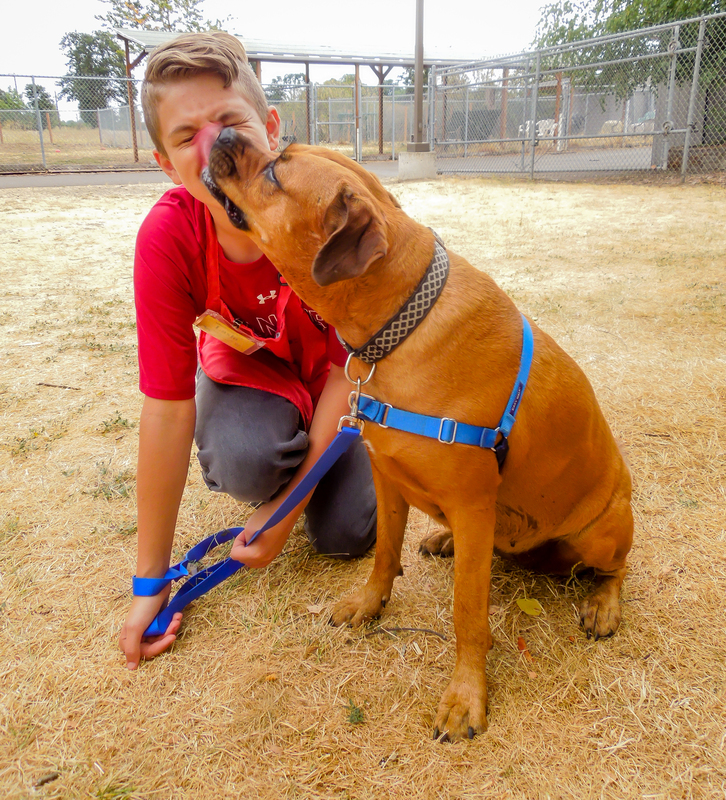 Sammi had a sweet, clownish personality, and all she wanted was to be petted. It didn’t take us long to decide she had to come home with us. The only problem was, Sammi already had a hold on her file, and we needed to introduce her to Freddy. So we added an additional hold, crossed our fingers, and waited. The next day we received the call we were hoping for. The previous hold had run out, and Sammi was ready to come home. 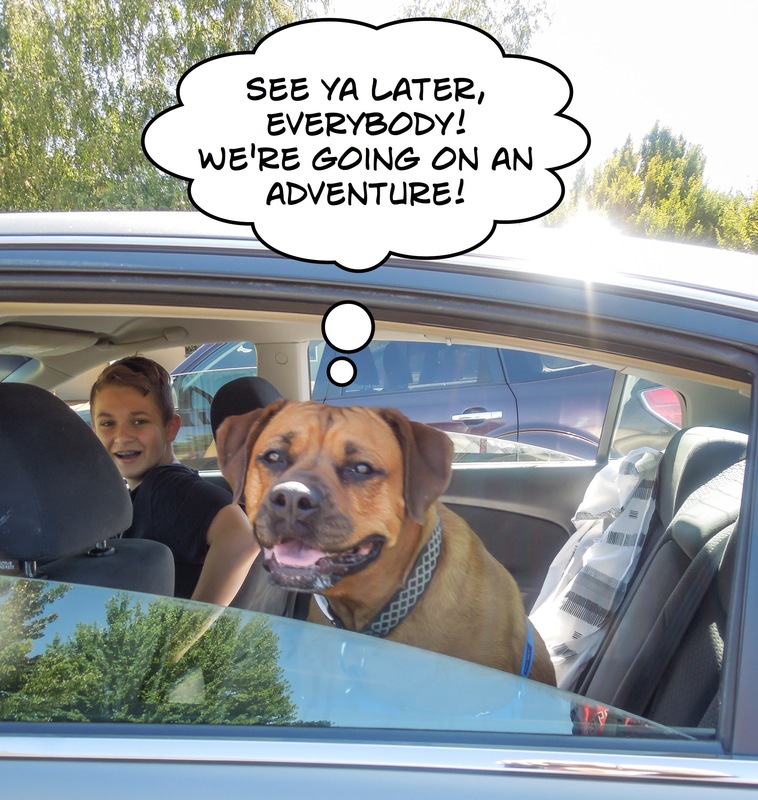 That afternoon we brought Freddy to the Humane Society, and facilitated a meeting between the two dogs. Sammi was ready to be friends right away, but Freddy was intimidated by the big dog with the big cone. 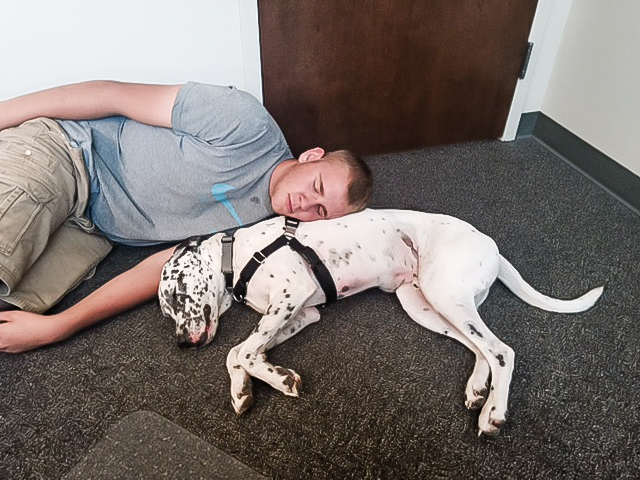 We were confident they would eventually get along, so we filled out the adoption paperwork and headed home. That’s it for this week! I’ll be gone next week, so my next post will be on August 19th.